3000 line totaly just for twoo Menu and one fullscreen jquery.. I have tried many FAQ sites, but have not found my answer, so I have come to ask here. •how does one change the font both of the menu items, and the font of the page/post body. Thankyou for this template! Its been wonderful, but was hoping to tweak to match my images. Fingers crossed for a reply here. at first when I use Preview, (in Edit HTML) the slideshows is working, but when I hit the Save Templates button the slideshows gone, only black background in there..
FYK, At first I used the ‘Upload xml file’ but it won’t work, then I just copying the script to the Edit HTML menu, but it wont do any good either..
cud u help me please? Slide does not work in Opera and Explorer. How to fix? Font for the upper menu is gone, please help! when I add a new page at the top menu, all of them disappear. Can anyone help? 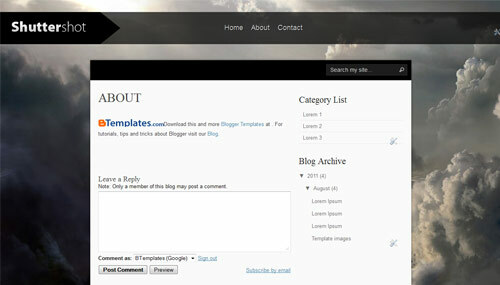 I like so much this blog theme and I need just one help. The theme dont apear the post. Plese, how I cam use de home page to show my posts? Please, help me. Does anybody know a solution to my wordpress shuttershot theme — background slideshow not playing in Internet Explorer. Firefox & Chrome are working fine. I want to change or cut Sign “>>” in menus and submenus . Hi, Theme is good and I like it very much but it’s not working fine in IE. I tried to fix it alot but no luck . Is there a way to use alt text within each image on the full page slideshow? How would that be added to each individual slide? cannot get this to open. Does this not work in mac? Is there a way for the blog page to show an entire image rather than just a portion of the image we uploaded. Right now, the teasers are only showing the center of the image and you have to click in for the full image, I would like the full image to appear instead. Can someone tell me how to do this? wonderful theme, thanx a lot for this. My full page template is currently on left side, but I would like it to be on center. Any suggestions? Thanks! How do I add a related posts widget to the individual posts I have tried 10 different types so far and all have failed. How do I add a light box to display the photos in a post better. Again I have tried a number of options and all have failed. 3 big things that have me reaching for my delete button a without them the template is pretty but useless. So if anyone out there can help that would fantastic, anyone, anyone at al!